Seville, Spain is a city recognized for its wealth of unmissable sites.While many of these places are recognized for their historic significance, there are many contemporary sites that deserve the attention of affluent travellers as well. 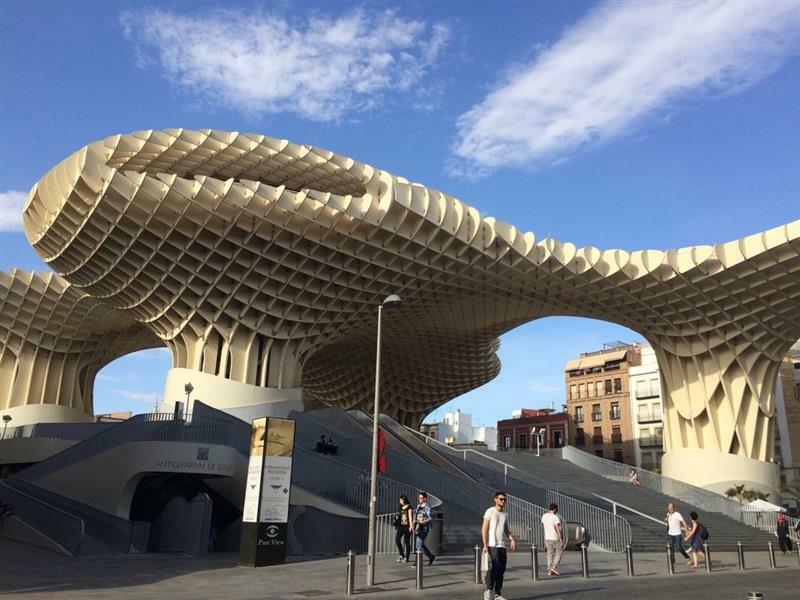 Among these worthwhile monuments is the Metropol Parasol - locally recognized as Las Setas de la Encarnación ("Incarnación's Mushrooms") due to their quirky shape. Boasting six parasols and four levels, the design of this structure was inspired by the vaults of the Seville Cathedral and the ficus trees in Plaza de Cristo de Burgos. The underground level is the Aniquarium, where Roman and Moorish remains were discovered during the construction of the structure. At street level is a market and a public plaza often used for events. Both the second and the third levels are platforms that feature a restaurant and fantastic views of the city center. Today, the Metropol Parasol is commonly used as a meeting spot for locals or as a shaded place to hangout during the hot summer months. Since the 19th century, a market building has been located in La Encarnacion square. During a period of urban renewal, the market was gradually torn down and remained dormant until 1990, when Seville chose to construct an underground parking space. This is when the ancient Roman and Moorish ruins were discovered, and construction was frozen. In 2004, the city ran an international bidding process to foster alternate ideas for this space. Construction of the Metropol Parasol began in 2005 and was finally completed in 2011 after considerable complications. Since its inauguration, the space has been chosen as one of five finalists in the European Union Prize for Contemporary Architecture. There are many ways to approach a visit to this space. Visitors can choose simply to walk around the site, view the city from the Mirador, or even use the space to host various types of public or private events. Given its large size, its central location around the beautiful Jewish Quarter, and its great views of the city, the Metropol Parasol provides a great venue to host many kinds of performances, presentations and events. If interested in using this monument to host an event, more information can be found on the official site. Many tourists choose to check out the balcony to make the most of the incredible structure. Visitng hours are from Sunday to Thursday 10:00-23:00 and Friday to Sunday 10:00-23:30. Access to the viewpoint is in the basement next to the entrance of the Antiquarium, and the ticket office closes thirty minutes before closing time. The cost to enter the observatory viewpoint is €3, or free for residents of Seville. The views of the entire city offered from this platform are indescribable. Otherwise, simply walk the exterior of the structure and absorb its contemporary feel. Its immense size and unusual shape are sure to spark curiosity. Many suggest visiting at night when the structure is lit up. This particular section of the Metropol Parasol is definitely worth further exploration. The remains discovered by accident during the initial conception of this structure tell tales of ancient history, and are presented over a space of five-thousand square meters. The archaeological tour, located at the entrance of the building, provides an informative show of the structural wonder of this site. Next is the archaeological room, where many fascinating remains are presented. Finally, the multipurpose area of the building offers temporary exhibitions and presentations. Opening hours are Tuesday to Saturday from 10:00-20:00 and Sundays from 10:00-14:00. Price of entry is €2 and free for residents born in Seville. 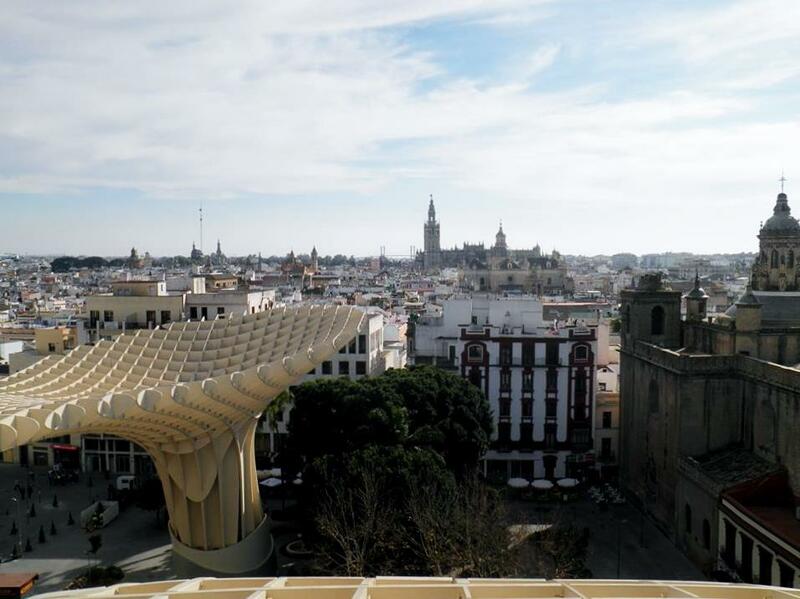 Given its central location, there are many ways to access the Metropol Parasol. By foot from the Seville Cathedral, this space is located north on Plaza del Triunfo toward Calle Mateos Gago. Follow this street as it becomes Calle de Placentines until finally turning right onto Calle Francos. Slight left onto Plazza Jesus de la Pasion, cotinue straight onto Calle Lineros until reaching Calle Puente y Pellon. From here, turn right towards the Plaza de la Encarnacion, where the giant wooden structure will be very visible. If choosing public transit, take bus lines 27 and 32 or the Metro T1, stopping at Plaza Nueva. There are many shops and restaurants surrounding this monument that accommodate the flow of visitors. Don't forget to bring money and a camera, but be weary of pickpockets as this busy touristic zone attracts many pickpockets. 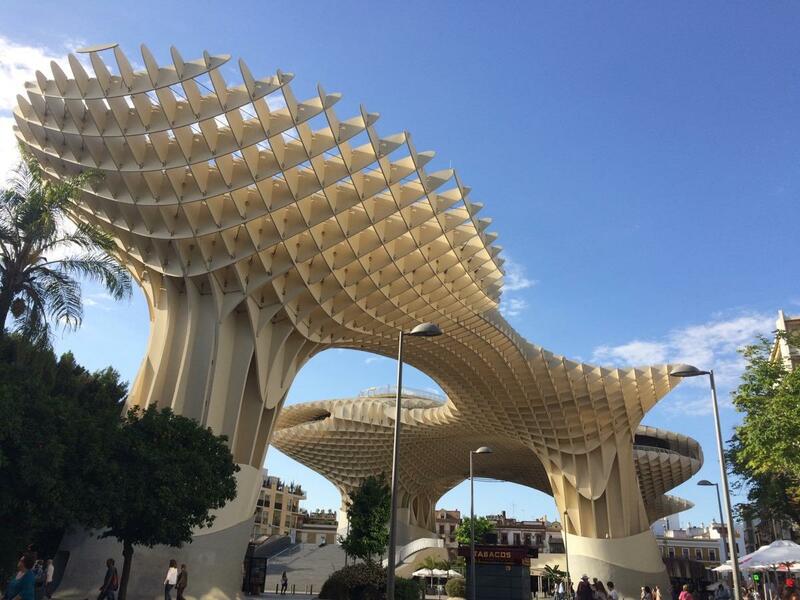 Regardless of how you choose to visit the Metropol Parasol, this particular monument doesn't take long to see. Combine this visit with a walk around the nearby Jewish Quarter, and you'll have a complete day of sightseeing Seville.